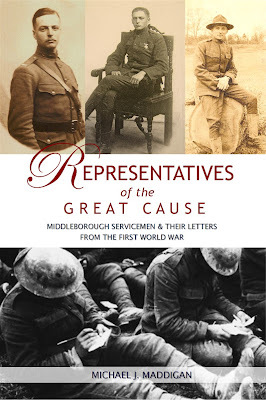 RECOLLECTING NEMASKET is proud to announce the release of its newest title, Representatives of the Great Cause: Middleborough Servicemen & Their Letters from the First World War by local historian Michael J. Maddigan. A moving compendium of letters written by Middleborough’s First World War servicemen, Representatives of the Great Cause documents the sacrifices made by the community at the time as well as its views and understanding of war. The book is Maddigan’s sixth volume of local history relating to Middleborough and Lakeville. “I am still one of the representatives of the great cause.” So wrote Middleborough soldier William F. Harris to local newspaper owner Lorenzo Wood in 1919. Succinctly defining the role of a single community’s World War I servicemen and women, Harris’s letter to Wood was one among hundreds written by Middleborough soldiers that were published in the Middleboro Gazette between 1917 and 1919. Today these poignant and frequently moving letters comprise the community’s largest and most important collection of documents detailing the experience of Middleborough veterans of any generation in their own words. In presenting a selection of these letters, Representatives of the Great Cause permits the voices of these men to be heard once more. While the authors of these letters may no longer present, their subject is universal and their words remain relevant today, providing a deeply moving reflection upon the course and meaning of war by those who experienced it first-hand. Representatives of the Great Cause will be launched at this year’s Krazy Days festival in downtown Middleborough where it will be available for sale at the Recollecting Nemasket booth on August 2 and 3. The author will be on hand to autograph his new work. Copies of his previous books will be available at this time as well. Books may also be purchased at any time following August 3 by visiting www.recollectingnemasket.blogspot.com. Michael J. Maddigan, Middleborough is a local historian and author of the popular “Recollecting Nemasket” column in the Middleboro Gazette. His other works include Images of America: Middleborough, South Middleborough: A History, Star Mill: History & Architecture, Elysian Fields: A History of the Rock Cemetery and Lakeville’s King Philip Tavern. Recollecting Nemasket is a small local history press devoted to publishing and selling histories related to Middleborough and Lakeville.